Blue Screen of Death… Memorial Tattoo? 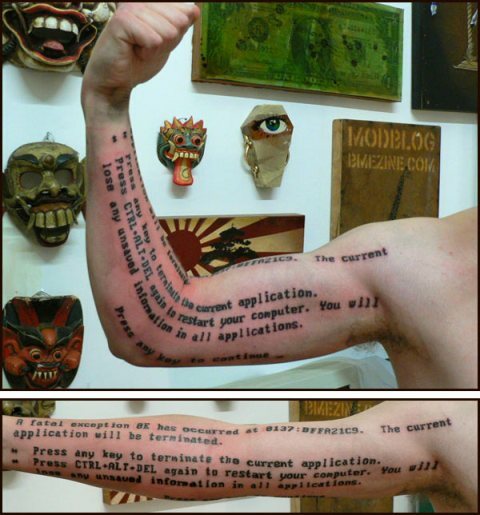 I don’t think this is quite what John means by death memorial tattoos, but I can’t help myself: a man got a tattoo of the insidious Microsoft Blue Screen of Death, ensuring geek awe, miffed stares and the sure-to-be short-lived internet fame of his string-bean arm and intriguing wall art. Oh my. Posted by Meg Holle in Death + Humor, Death + Popular Culture and tagged memorial tattoos. Bookmark the permalink.